Posted by Yilan in EU, European Union, Roma. Belgrade – The recent French expulsions of illegal Roma immigrants has drawn attention to an ethnic minority which has spread across many borders and faces the same problems and prejudices almost everywhere in Central and Eastern Europe. There are several million Roma, or Gypsies, in Eastern and Central Europe, but their exact number is elusive, as many remain unregistered or declare themselves differently to minimize prejudice. Unemployment and illiteracy rates among them are several times higher than that of the majority populations across the region, as few finish even elementary schooling. Many live in illegal shanty settlements without basic infrastructure or hygiene and limited or no access to health and social care. It is estimated that there are up to 2 million Roma in Romania, almost four times as many as the official figure of 540,000. In Bulgaria, they are the third-largest ethnic group, behind Bulgarians and Turks. The 370,000 registered in the 2001 census made up 4.7 per cent of the population. It was Roma from Bulgaria and Romania, the latest additions to the European Union, who were repatriated this year by France amid much controversy. Those expelled said they had hoped to escape the utter poverty of their lives in their home countries. Tens of thousands of them live in favela-like settlements, in homes patched together out of mud, cardboard, tin and plastic. In Slovakia, half of the 400,000-strong Roma population lives in quasi segregation, partly in slums akin to those in the Third World. In several communities, the majority population has moved to physically separate themselves from the Roma, even going so far as to build walls, such as in the eastern town of Presov. A similar situation exists in Hungary – most of the 600,000 Roma live in ghettos in the north and north-east and remain unintegrated, with just 1.2 per cent graduating from high school. Work is scarce and that available is mostly poorly paid. Life expectancy among Hungarian Roma is 15 years shorter than the national average. The Roma are also vulnerable to violent hate crimes. In Hungary, at least six were killed in a series of attacks, including shootings and petrol-bombing of the victims’ homes, in 2008 and 2009. Four men were eventually held over the killings. Roma have also faced discrimination and outright hostility in Slovenia, the most developed among the batch of countries which joined the EU in 2004. 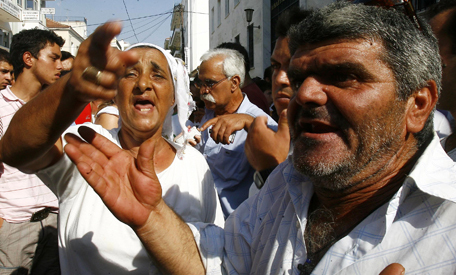 In October 2006, the Strojans, a Roma family, were driven from the village of Ambrus by angry residents. Their home, a house and several shacks, were torched and they spent several days hiding in the forest until the authorities relocated them to an empty army barracks. In Serbia, there are 110,000 registered Roma, but it is estimated that they are nearly eight times as numerous. there are at least three large squatter villages, contemptuously referred to as ‘cardboard cities,’ with hundreds of makeshift homes and tons of rubbish surrounding them. An estimated 80,000 to 100,000 Roma live there. According to studies, 60 per cent of Roma children never complete the mandatory eight years of elementary school and a third of men and half of women are illiterate. Roma who have jobs often work for the communal services, as street cleaners or rubbish collectors. As elsewhere, they, and even their children, are vulnerable to hate attacks by extremists. In 1997, a Roma child, from a working family with a home in central Belgrade, was beaten to death by a gang of skinheads. A well- known Serbian actor, Dragan Maksimovic, was also fatally beaten in 2001 when a group of extremists mistook him for a Gypsy. Hate attacks on Roma have been reported in almost every country where they live, from Poland to Italy, the Ukraine to Ireland. Posted by Yilan in France, Roma. After a summer marked by a needless quarrel over how to treat their Roma population, the French seem on course for an autumn of discontent over issues much closer to their pocketbooks: the reform of their state pensions. For the trade unionists and leftists gearing up to take on President Nicolas Sarkozy and his government over treasured welfare benefits, protests may well drown out the summer storm over the Roma. For the rest of Europe, the memory may not fade so fast. Karel Schwarzenberg, at 72 now foreign minister of the Czech Republic for a second time following the surprisingly strong showing of his new TOP09 party in elections last autumn, was musing on his embassy’s magnificent terrace overlooking the Eiffel Tower when he hit what felt like an important point. Many “refugees of our nations found asylum in France,” Mr. Schwarzenberg noted. No names were mentioned, but Milan Kundera, the Czech author who has been in Paris for decades, is a clear example. The scion of one of Central Europe’s mightiest landowning families, Mr. Schwarzenberg, who in Communist days supported anti-regime dissidents in his native Prague from his family holdings in Austria, might not seem the natural critic of a conservative French leader with Hungarian roots. But he has seen the vicissitudes of power, and different fates, on a continent that 20 years after the Cold War still struggles for unity. When it comes to problems like the Roma, he suggested, the best politics is local. Without sparing criticism of Czech policy — the “mistake,” for instance, of effectively segregating Czech Roma in special schools — he lauded the mayor of Cesky Krumlov, a Baroque jewel in the south of the Czech Republic, where Roma have not been marginalized in ghettoes and take a pride and a part in keeping the town spick and span. Behind this lies a complex history of Nazi destruction of the Roma, one of Europe’s most ancient cultures, he noted. In Czech lands, almost all indigenous Roma died in Nazi camps, Mr. Schwarzenberg said. Those who settled in and near Czech cities after 1945 were already outsiders, descended from Roma from Romania, Hungary and Slovakia, and lacking the Czech language. That kind of ethnic fracturing has vastly accelerated, Mr. Schwarzenberg noted, with the more recent migrations into Western Europe. When he studied in West Germany in the 1950s, he said, Italian and then Yugoslav workers were just arriving. There were almost no Turks — now estimated to number about 2.7 million in Germany. Similarly, the suburbs of Paris were French, and not — as in some areas today — North and sub-Saharan African. The Netherlands was home to some Indonesians loyal to Dutch colonial masters, but there was no sizeable immigration. Europeans need “some time to adapt,” he said, while dismissing, as “a bit tactless,” the ideas of Thilo Sarrazin, the German banker who has created a stir for saying that immigrants, notably Turks, have contributed little or nothing in Germany. The furor this summer over France’s expulsions of Roma to Romania and Bulgaria — European Union countries whose citizens still have limited rights to free travel in the 27-nation bloc — would pale by comparison to the prospect of full E.U. membership for Turkey, a country of 80 million people. Mr. Schwarzenberg, conscious, he said, of being “only” foreign minister of a Central European nation of about 10 million people, has quite firm ideas about how Europe should react to Turkey, and what it must get done first. But before Turkey, Mr. Schwarzenberg said, let Europe finish other tasks. Noting the creation of a new European diplomatic service, he said, people like the Czechs should ensure they are well represented, thus increasing domestic identification with the European Union. “We have to show that we are there to do our best and be valuable members of the E.U.,” he said, alluding to the gaffe-prone Czech presidency of 2009. Next, he noted, all Europeans should work with the Poles and Swedes to emphasize partnerships to the East — Ukraine and Belarus, principally — to overcome lingering division of Europe. In the same vein, the western Balkans — Albania and the remnants of the old Yugoslavia — should join the fold. He conceded that parts of Eastern Europe bear scars of what he called the continent’s “prolonged civil war” between World War I in 1914 and the collapse of Communism in 1989. Yet 20 years after the Velvet Revolution, he said, his country is a fairly prosperous, fairly normal democracy. Posted by Yilan in EU, European Union, France, Human rights abuses, Roma. The European Commission is following very closely France’s dealings with its Roma, who the authorities are planning to expel in groups, Commission representatives said yesterday (18 August), after being asked by the Brussels press whether the expulsions were in line with EU legislation. According to the European Commission, Roma are the EU’s largest ethnic minority, and trace their origins to medieval India. There are many Roma subgroups living in Europe. Current census statistics state that 535,000 Roma live in Romania, 370,000 in Bulgaria, 205,000 in Hungary, 89,000 in Slovakia and 108,000 in Serbia. Some 200,000 Roma are estimated to live in the Czech Republic, while the same number are estimated to reside in Greece and an estimated 500,000 are in Turkey. Many Roma from Eastern Europe moved to the West following the EU’s enlargement, creating tensions, particularly in Italy. EU countries have the right to take security measures regarding foreigners residing on their territory, but “we’re following the situation with great attention,” Commission spokesperson Amelia Torres said. Torres said two commissioners were dealing with the issue – Justice, Fundamental Rights and Citizenship Commissioner Viviane Reding and Employment, Social Affairs and Inclusion Commissioner László Andor. Today (19 August), France begins to expel around 700 Roma, mostly from Romania and Bulgaria, who are living illegally in the country, the French press reported. On 28 July, French President Nicolas Sarkozy launched a new anti-crime initiative targeting the “itinerant population,” with a particular emphasis on the Roma community (EurActiv 29/07/10). Immigration Minister Eric Besson said 79 Roma, who have agreed to return home in exchange for 300 euros for adults and 100 euros for minors, will board a charter flight bound for the Romanian capital Bucharest on Thursday. He said police had so far dismantled 51 illegal Roma camps and two flights would take the Roma to Romania and Bulgaria on 19 and 26 August, with a third flight set for the end of September. Journalists wanted to know the basis on which the expulsions of 700 people were being made, as EU legislation requires each case to be examined individually. A Commission spokesperson replied by saying that he would give such details later, as for the time being the EU executive was monitoring the situation. Teodor Basconschi, Romania’s foreign minister, voiced fears of mounting xenophobia in France over the Roma expulsions. “I am concerned about the risks of populist provocation and of creating xenophobic reactions at a time of economic crisis,” he said in an interview with the Romanian service of French radio station RFI. Basconschi, a former ambassador to France, called for a joint Franco-Romanian approach to resolving the situation, devoid of artificial election fever. He was seemingly referring to Sarkozy’s weak prospects in view of the 2012 presidential elections. The president and founder of the Party of the Left, Jean-Luc Mélenchon, described as pitiful the French government’s policy toward Roma and accused Sarkozy of sparking a climate of tension just to be able to play the role of Zorro. “No-one gains anything by trying to hide the complexity of certain topics,” he continued. “Since the beginning of the summer, the president needs scapegoats,” Mélenchon argued. At official level, Bulgaria remained silent over the controversy, but editorialists from the opposition press blasted Sarkozy’s policy of “deportation”. It is believed that the number of Roma from Bulgaria in France and Western Europe as a whole is much lower than the number who come from Romania. France‘s ruling right-wing UMP party lashed out at a UN committee that accuses the government of failing to stem a rising tide of racism in the country. Members of the UN’s Committee for the Elimination of Racial Discrimination (Cerd) come from countries which do not respect human rights and are “100 leagues from reality,” party leaders said on 13 August, quoted by RFI. “Not every country that is on it is an example of living democracy or of respect for minorities,” said UMP MP Christian Vanneste. “Algeria, Russia and Romania, which treat Roma very badly – you see the state they’re in when they get here,” he added. The committee’s report denounced the “lack of political will” to bring to an end the allegedly increasing number of racist and xenophobic incidents. The report also criticised French President Nicolas Sarkozy’s recent declarations concerning the Roma population in France, as well as his plan to strip criminals of foreign origin of French citizenship. Posted by Yilan in France, Human rights abuses, Roma. France’s deportation of Roma is nothing short of state-sponsored racism. When will the international community stand up for us? 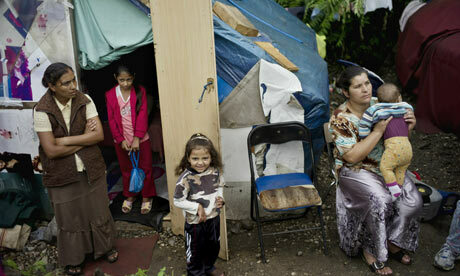 Roma women and children in a Lyon camp who stand to be expelled under Nicolas Sarkozy’s proposals. Photograph: Jeff Pachoud/AFP/Getty ImagesWhat era are we living in? The sad answer is that we are living – once again, it would seem – at a time when France is harassing and expelling its Romany population in the name of law and order. Last week, the French government began the roundup of more than 700 Romany immigrants from Bulgaria and Romania, and ordered special flights chartered to send them back to their home countries. The deportations will begin on Thursday. Over the past month, the French government began dismantling Romany camps; at present, more than 50 camps all over France have been destroyed by the state. At the same time, France has announced two other policies directed at Roma, Travellers and other immigrants: the criminalisation of entire families rather than just individuals and the stripping of citizenship from immigrants with criminal convictions. These measures are part of a wider law-and-order push by President Nicolas Sarkozy following a weekend of rioting in two cities in July. In a poor suburb of Grenoble, southeast France, young people torched cars and fired on police following an incident in which a suspect in a casino robbery was shot dead. In Saint-Aignan, in central France, police shot dead a 22-year-old Romany man for failing to stop at a roadblock. Roma armed with hatchets and iron bars felled trees and traffic lights, torched cars and attacked a bakery and a police station. This is the first time France has seen protests by Roma youth taking the form of violent disturbances; the current rioting was similar in substance, though smaller in scale, to the immigrant-led 2005 riots that broke out across France’s suburbs. Rather than sympathy for the families who lost their sons, or an apology for the police killings, the protests and riots were met with immediate state violence, expulsion and criminalisation. The Sarkozy government’s attacks on Roma are nothing more than cynical politics, state-sponsored racism and xenophobia aimed primarily at Roma citizens and, by extension, all immigrants. They have arisen as window-dressing on the unfolding corruption scandal surrounding Sarkozy. This happened despite the fact that the young Romany killed was French and those expelled were citizens of EU member states, who have a right to enter France without passports, staying if they find employment within three months. One wonders how closely paperwork was checked with regard to residency and employment as the camps were being dismantled and EU citizens expelled on chartered flights. France is not alone in its attack against its own Romany citizens and those of other EU member states. Leaders all over Europe have found it expedient to attack Roma as recessions have hit, political scandals have loomed or other kinds of threats to state power have emerged. Indeed, Sarkozy seems to have been taking lessons from his conservative counterpart in Italy, Silvio Berlusconi whose government has increasingly focused on Roma as targets of state violence and everyday xenophobia. Similar things are happening in places ranging from Slovakia to Hungary, Bulgaria and Turkey. As a US Romany woman, I have been appalled to observe what has been happening to my people throughout Europe. I am shocked that the international community has not been more active in speaking out and taking action against this state-sponsored violence. When it comes to Roma, when will nation-states be held accountable? How long will we have to witness the spread of what can only be called proto-fascist violence against Roma without condemning those responsible? The initial riot in response to the killing of the young Romany a few weeks ago was followed on Sunday by a planned protest by Romany groups that blocked a major highway in Bordeaux, in protest of the deportations and targeting of the Gypsies, Roma and Travellers by the state. At this moment, international solidarity and protest against Europe’s targeting of Romany citizens is crucial. We need to act in concert: the UN, the European Union, the UK government, the US, human rights and other activist organisations, and all parts of the Romany diaspora must work to make sure that the state-sponsored violence is stopped. Romany people should be granted the full rights of citizens to political participation, education, healthcare, freedom of movement, freedom against violence, dignity and respect.